My knowledge of modern China is limited; my mind’s eye forming images and opinion based on news stories or photographs. Past ponders on “ghost cities”, factories, use of banned pesticides, pollution and foreign investment do little to sharpen the image. I can’t speak from experience, all I can do is ponder. New South China Mall is worth a ponder; a development that simply doesn’t make sense, another example of the China I don’t understand. Chinese billionaire Hu Guirung – his fortune made in instant noodles – secured a loan from the Agricultural Bank of China to build the world’s largest mall in Guandong Province. I can’t speak to relevance but find it interesting this bank was a “policy bank”, one that made loans based on government policy rather than economic feasibility. When completed in 2005 it had space for 2350 stores and a 99.5% vacancy rate. Located in Dongguan, a massive industrial city of over 7 million residents with an area twice the size of Los Angeles – economic feasibility missed the mark and then some. Over 5 million residents classified by the government as “permanent migrants” – primarily women working in factories, with wages to match. Throw in toll highways leading to the mall, absence of public transportation, reputation for high crime in the area – it soon becomes clear why low income workers didn’t flock to shop. Amusement park, areas designed as “cities of the world” – Rome, Paris, Amsterdam – deserted. 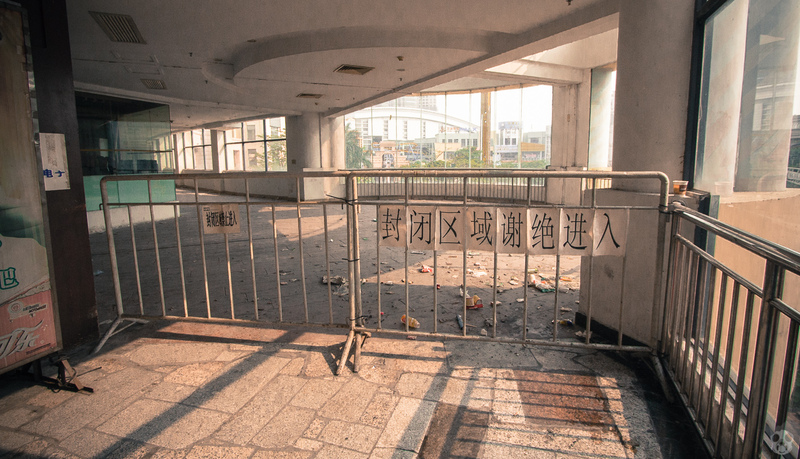 Security guards positioned to keep people out; best of all, mall president Kun Liu announced in 2011 , a period of “strength accumulating quietness” would be broken with development of another 2 million square feet. All you have to do is walk into Wal-Mart or count dollar stores on your street to grasp where China is making money. A select few becoming extremely wealthy; wealthy enough to build grotesquely bloated malls or “ghost cities” driven by real estate speculation. I can’t help but find it absurd. A link to my post on “ghost cities”….